Clark County Sheriff Joseph Lombardo says the hundreds of people wounded in the Las Vegas mass shooting were taken to five southern Nevada hospitals. Sunrise Hospital and Medical Center says in a statement it received 14 patients who died and more than 160 who were injured. The statement on Monday said the Las Vegas hospital’s doctors performed about 30 surgeries and that police were still trying to notify relatives of the victims. Hospital CEO Todd Sklamberg said most of the hospital’s trauma team and staff worked through the night after the shooting that killed at least 58 people and wounded more than 500. The United Nations says Secretary-General Antonio Guterres was “very shocked and alarmed” by the deadly attack in Las Vegas. U.N. deputy spokesman Farhan Haq said Monday it was a horrific loss of life. Haq said the secretary-general will be writing a condolence letter to the government of the United States to express sorrow at the large number of killings. The father of Las Vegas shooter Stephen Craig Paddock was described decades ago by the FBI as a “glib, smooth-talking” con man who enjoyed gambling, umpiring prison sports games and playing bridge. Paddock was 7 and the oldest of four children when his father was arrested for a string of Phoenix bank robberies. Neighbor Eva Price took the boy swimming while FBI agents searched the family home. Before the robberies, he served prison time in Illinois for stealing a car, engaging in a confidence game and conspiring to pass bad checks. He was in prison for the first three years of his oldest son’s life. Las Vegas shooter Stephen Craig Paddock’s father was a notorious bank robber who tried to run down an FBI agent with his car in Las Vegas in 1960 and was on the agency’s most wanted list after escaping from a federal prison in Texas in 1968. Stephen Paddock’s brother, Eric, confirmed their father’s identity in an interview Monday with The Orlando Sentinel. Clark County Sheriff Joseph Lombardo also said Monday that investigators are continuing their collection of evidence and working to reunite people with relatives who were at the shooting site. 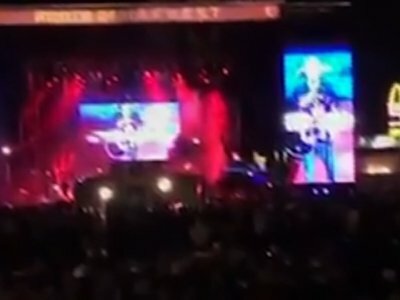 Police say Stephen Craig Paddock was on the 32nd floor of the Mandalay Bay casino-hotel tower Sunday night when he opened fire at concertgoers at the Route 91 Harvest festival. At least 58 people were killed and more than 500 were wounded. Authorities have set up hotlines and centers to help people track down relatives. Lombardo says he expects a convention center to be used for that because authorities need a large space. A brother of the suspect in the worst U.S. mass shooting in the modern history says Stephen Craig Paddock was “not a normal guy” and frequently played high stakes video poker. Eric Paddock says last had contact with him via text messages in September. Authorities say Paddock opened fire on a crowd of concert-goers at an outdoor country-music show in Las Vegas on Sunday night, leaving 58 people dead and more than 500 wounded. LOS ANGELES— Authorities say law enforcement members from across California are among those wounded in a mass shooting at a country music festival in Las Vegas. The Los Angeles Police Department says Monday that an off-duty officer who was shot in the leg is expected to recover. LA County Sheriff’s officials say two off-duty department employees were hit by gunfire Sunday. One was critically injured and the other is stable. Orange County authorities say one off-duty sheriff’s deputy and two wives of department employees sustained non-life-threatening wounds. Bakersfield police say one of its off-duty officers wounded in the gunfire is expected to survive. Police in Ontario say a 24-year-old officer who was wounded is stable. The officer’s wife had minor injuries. Sunday’s shooting killed 58 people and injured more than 500 others.